FabLab Tulsa from Zane Blanchard on Vimeo. In late May I received an educational membership to the FabLab in Tulsa as part of an initiative at the school where I teach. We are planning to create our own maker space on campus so that our students can learn skills needed to tinker, develop and create ideas. On one of the last days of school, I visited the lab for the first time and took a tour. Though I could see that the space and the tools offered great creative potential, it all seemed a bit alien to me. I wasn’t sure how I could use the lab or what project I might want to try. In mid-June I read the book The Maker Movement Manifesto: Rules for Innovation in the New World of Crafters, Hackers, and Tinkerers by Mark Hatch, who is the CEO of Techshop. This book helped me understand what all the fuss is all about, and why, as an educator, it is important for me to learn these skills and how to apply them in my classroom. Mr. Hatch ends his book by saying that the best thing you can do is to start with an idea and have a project in mind. I wanted to create a project that would not only produce something that I was passionate about, but also produce something that would have a practical use when it was finished. After some thought, I chose a stick board. 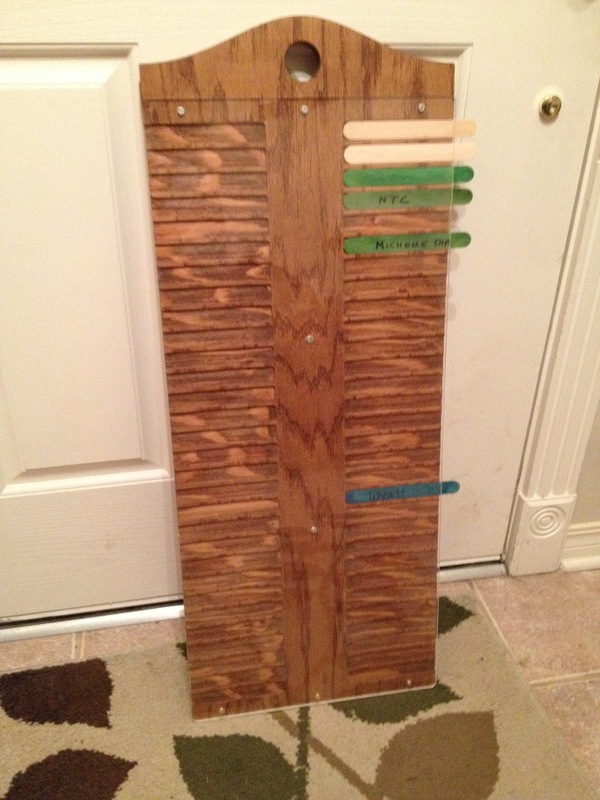 The purpose of a stick board is to help a coach see and arrange team lineups quickly, allowing him or her to make real-time decisions about lineups with a minimum of fuss. 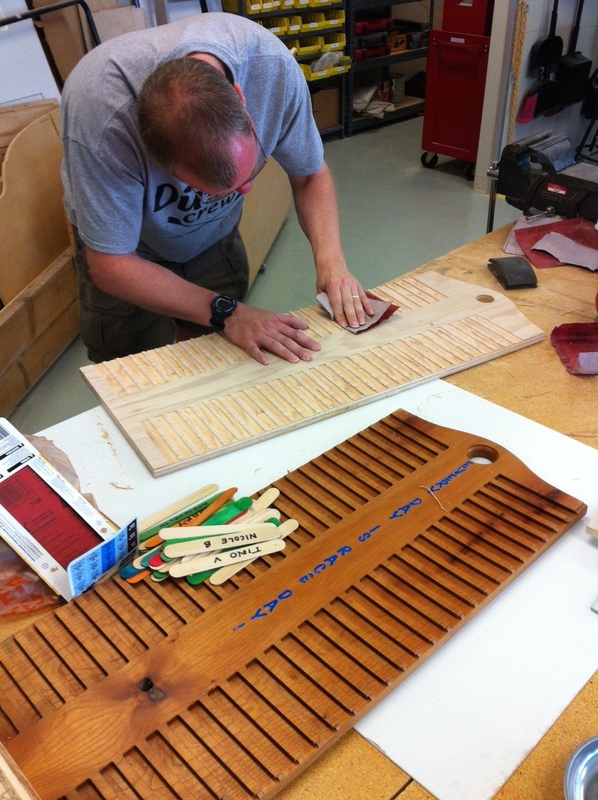 The coach uses a marker to write boat names and athletes’ names on craft sticks. Then the sticks are inserted into the grooves and rearranged to adjust the lineups. TYRA already has several stick boards (made by a dear friend and college teammate of mine, Mike Lyons, who is now a professional woodworker), so I decided that I would make this stick board for Kevin Harris, Head Coach of the University of Tulsa Women’s Rowing team, in appreciation of his support of our team. I went to the lab and visited with Dan Moran, one of the technicians. 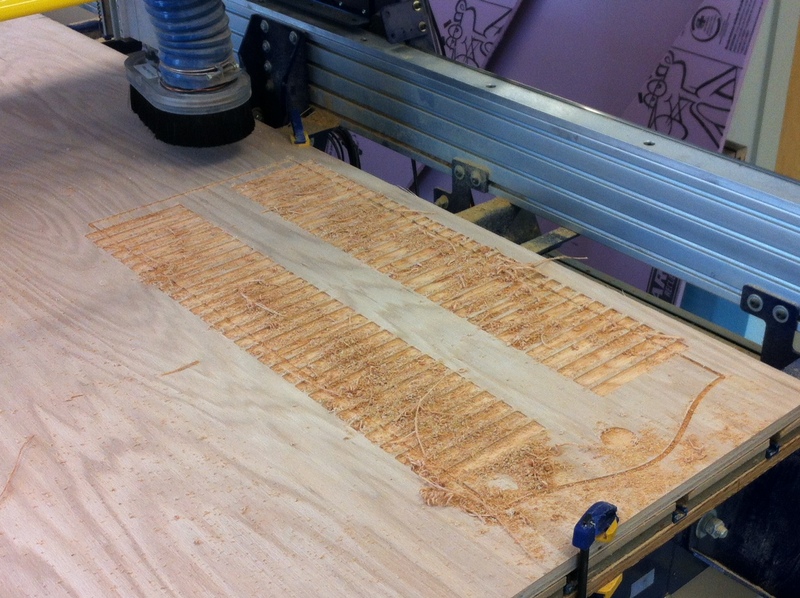 He was very helpful in explaining how the milling shopbot worked and how it could be used to create the wooden part of the stick board. He also suggested that we put a piece of acrylic on the front of the stick board, so that the sticks would be more secure in their pockets. (This idea turned out to be a great improvement in the design.) I spent the next few hours driving around town collecting the materials that were needed for the board. 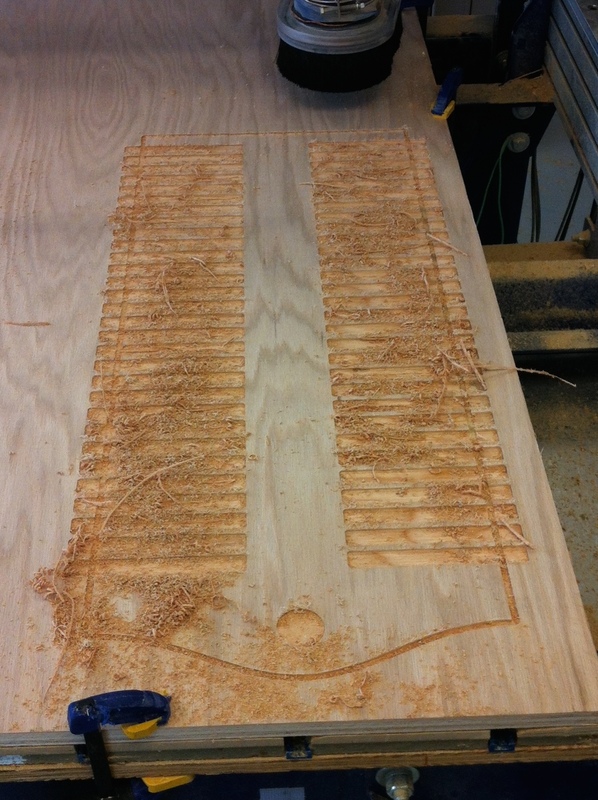 First the ShopBot milled the holes for the sticks. 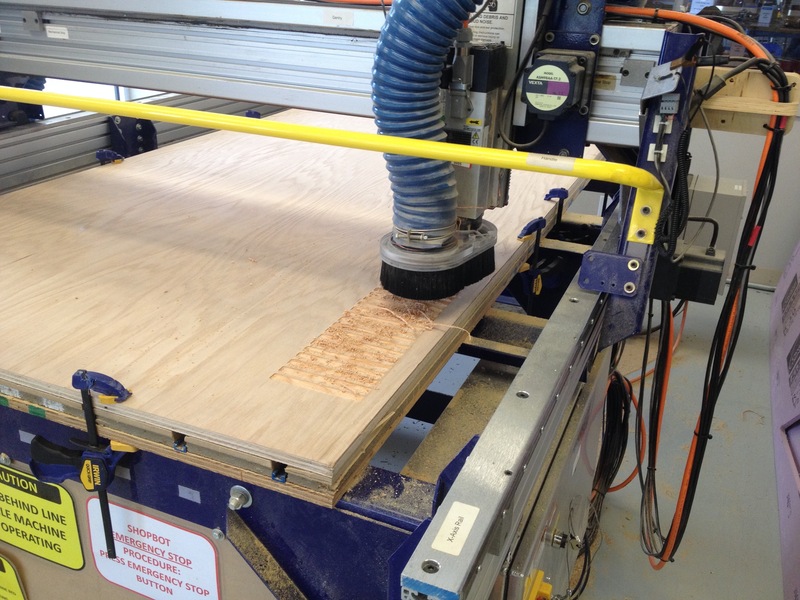 After the milling machine was finished, it was time to remove the stick board from the plywood. 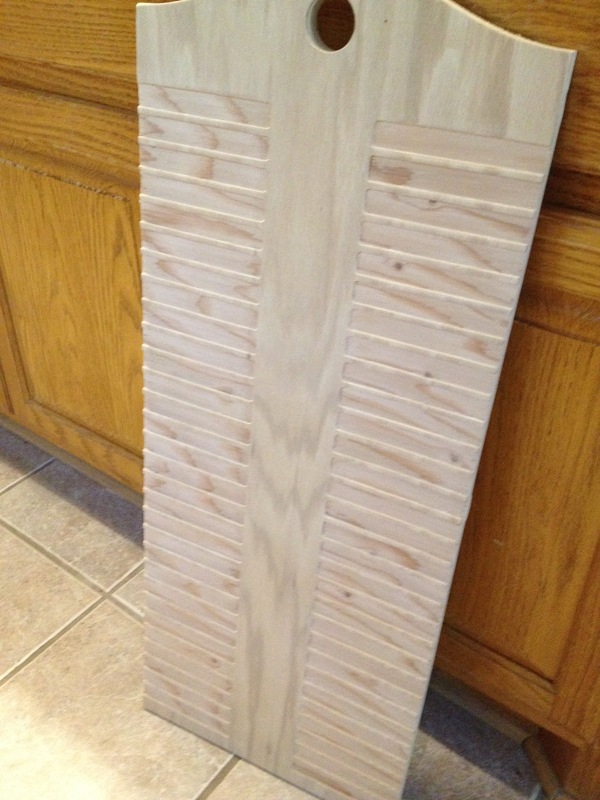 After removing the cut wood from the original plywood 4 x 8, it was time for sanding. 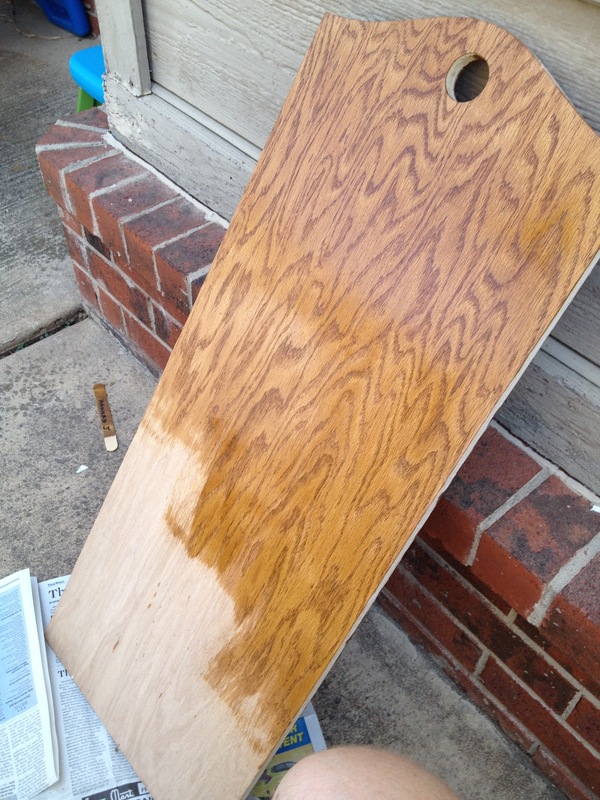 the next stage was to stain and seal the wood. Finally, Dan helped me use the mill once more to cut a piece of acrylic that would cover the wood on the front preventing the craft sticks from falling out. We used screws to attach the acrylic to the board. 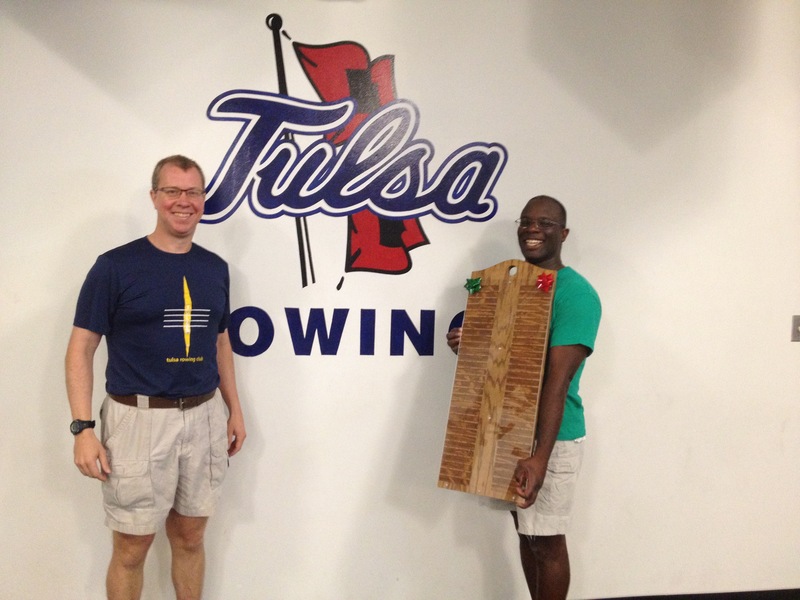 Once the board was complete it was time to deliver it to its new home with Coach Harris at the University of Tulsa. I hope that the stick board will serve as a small token of our appreciation for all of TU’s support over the last twelve years. Their program is growing every year, so I am probably going to need to make them more stick boards soon! This project was a great adventure, and I learned a great deal in the process. Making this type of board using a programmed machine, rather than creating each groove by hand, was simply not possible a few years ago. The next challenge will be for my school to leverage this concept and create meaningful learning experiences for our students. These types of projects will help students (and teachers!) navigate our ever-changing technological context and carry their new found skills into the 21st century.